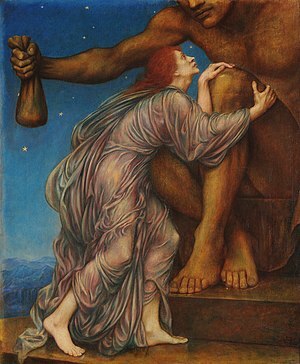 If you want to get rich, Mammon is the demon for you! Little known fact: Mammon serves the hellish ambassador to England. Why England? Who knows? A member of Satan’s vile harem. Naamah’s a hot female demon who likes hanging out with her gal-pal Lilith. Her name means ‘charmer,’ but that might just be ironic–or it might refer to her penchant for charming men into the worship of false idols. She might originally have been a human woman, the daughter of Lamech and Zubal according to Genesis 4:22. In the myths where she was human, she was so beautiful that she tempted the angel Shamdon to sin. Their most famous kid was Asmodeus, though they had a bunch of other demon-spawn, too. Using Kabbala magic, she was transformed into a spiritual being/demon. She and Lilith run around at night, strangling babies and seducing men. Now, this ‘seducing’… There may actually be a more prosaic force at work here. The whole idea of succubi probably grew out of the, uhm, occurrence… that sometimes happens to males… uhm, at niiiight… and more often to teenage boys at night… due to their, uh, hormones… Oh hell. She has spirit-children by the men she seduces, but they are all raised by Lilith. Interesting–Naamah is seen as the inventor of divination in Kabbalistic mythology. And she’s kind of the patron saint of prostitution, demon-wise. Ipos is a weird sort of character. This earl-slash-prince appears in the form of an angel. But, not your ordinary angel. According to the Goetia, he’s an angel with “with a Lion’s Head, and a Goose’s Foot, and Hare’s Tail.” I wonder if he just has the one goose foot. Like other demons (and A Christmas Carol), he knows all things past, present and future. Unlike other demons, he makes his masters the life of the party–witty and bold. Thirty-six legions of Spirits fall under his command. The Goetia says that Aim is “a very handsome Man in body.” But the Goetia’s definition of handsome isn’t the same as mine, since he has three heads. He has one serpent head, one calf head, and one head that’s a man, but with two stars on his forehead. He rides a viper and carries a firebrand. Aim loves to set cities, castles and places on fire. Like Ipos, he makes you a funny guy. Berith is a sneaky sort of demon. The Goetia says he’s also called Bofry/Bolfry or Beale/Beal. But is Beal all that different than Baal? Are they possibly the same or related? Berith is another soldier, and in fact another red solider, like Zepar. Confused yet? Another came forth, a red horse. To him who sat on it was given power to take peace from the earth, and that they should kill one another. There was given to him a great sword. Like with Beleth (and what about the similarity with that name? ), you have to use a ring when you summon him. Or else. Or else what, I don’t know, and I don’t want to find out. Berith can turn any metal to gold, which is maybe why he wears a gold crown. The Goetia usually uses one or two adjectives, but Berith gets three–he is a MIGHTY, GREAT, and TERRIBLE Duke. It also says he talks in a clear and subtle voice, if that’s not an oxymoron. changing into another shape, you might feel a kinship with Marbas. As a Great President of Hell, Marbas commands 36 Legions of Spirits. Here’s his seal. When you summon Marbas (and please don’t) and you succeed, he’s going to show up in the form of a lion. If that doesn’t turn you on, you can ask him to take on a human form. But whatever you do, he’s still a demon, so maybe it’s just smarter take your aspirin and lie down if you’ve got a cold. He is a Great President, and appeareth at first in the form of a Great Lion, but afterwards, at the request of the Master, he putteth on Human Shape. He answereth truly of things Hidden or Secret. He causeth Diseases and cureth them. Again, he giveth great Wisdom and Knowledge in Mechanical Arts; and can change men into other shapes. He governeth 36 Legions of Spirits. 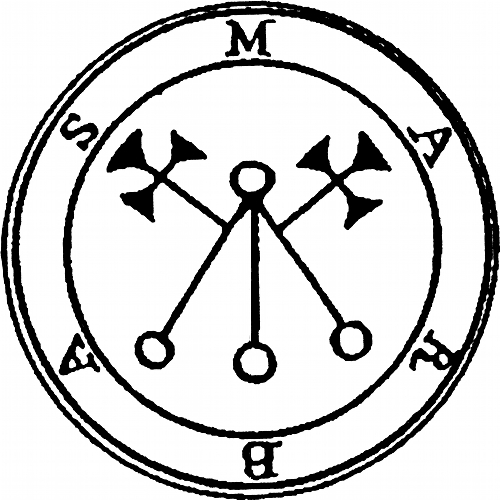 And his Seal is this, which is to be worn as aforesaid. Sitri is a Great Prince of Hell, and when he is first summoned he appears with a Leopard’s head and the wings of a Gryphon… which is interesting since a Gryphon is described as having the wings of an eagle. If the summoner commands it, Sitri will turn into human form–in fact, a very hot human form. His special power is turning up the heat on lust. Men in his vicinity will run after the nearest woman; women will go after the nearest guy. For extra measure, he can give you the power to see through clothing if you’d like. I found Vassago a tough spirit to nail down. Not much out there. A guy named Aaron C. Donahue claims to have raised Vassago and that he looks like this. So, you can call on Vassago if you lose your cellphone. But here’s my question… If he’s such a ‘good’ spirit, why hasn’t doesn’t anyone talk about him? Maybe something happens to everyone who sees him. That’s my conspiracy theory version. Marax is both an earl and a president. When he shows up, he looks like a bull with a man’s face. He commands thirty legions of spirits. He teaches astronomy and the liberal sciences. He knows what herbs and stones are good for and can hook you up with other familiar spirits. A great and strong Duke… He appeareth like a Xenopilus. He telleth all things, Past, Present, and to Come, and showeth the meaning and resolution of all questions thou mayest ask. He conciliateth and reconcileth friendships, and giveth Honour and Dignity unto any. He ruleth over 40 Legions of Spirits. His Seal is this, the which wear thou as aforesaid. Now that sounds like a handy dude to have around for a soulless monster who would like nothing better than to drag you to Hell to suffer with the rest of the Damned. I get the part about knowing the past, present, and future. And knowing the answer to all the questions you might ask. Honor and dignity are handy. So are friends. But what the heck is a “Xenopilus”? A little research turned up Xenophilius, which is the Greek term for someone who loves all things foreign (I can dig it.) and a character in Harry Potter. Somehow I didn’t think that was the answer. Finally, a winding path led me to the possibility that it’s a mistranslation of “Cynocephalus.” As in a creature with the head of a dog.